I’m a big fan of G3 gear. 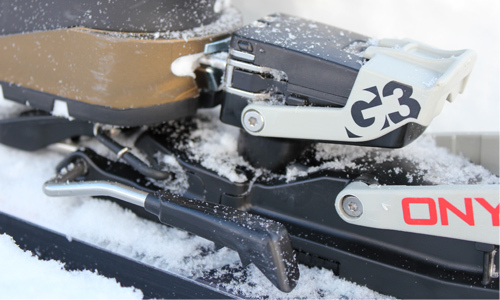 Not only are they a Canadian company but they tend to make high-end, well thought-out products for backcountry skiing. When I was on tele skis (before my knees convinced me to go to AT) I skied with the G3 Targa bindings. They were some of the first beefy cable bindings and I loved ‘em. For AT binding, I have skied on Fritschis, and Dynafits. I was happy to see the Onyx when it came out and have had the opportunity to sample them for a while now. I have them mounted on the G3 Manhattan skis (look for a review on the Manhattans in the not-too-distant future). 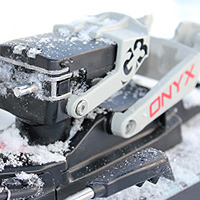 The Onyx is a “tech” binding—meaning it works only with Dynafit compatible boots. They’re the ones with the little holes on either side of the toe and the cut-out and metal insert on the heel. Virtually every AT boot maker offers tech-compatible boots these days. I think it’s really the only way to go—I’d even go so far as to say any tech binding is better than a “standard” binding. The beauty of the tech rig is clear on the up. 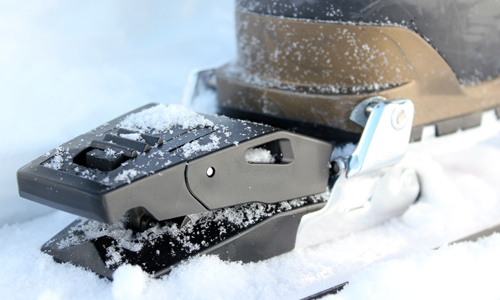 Unlike other bindings, tech binding design means you aren’t lifting a clunky, heavy binding heel piece with every step. It’s a fundamental difference that you’ll realize immediately when you experience it. I have my DIN set at about seven and I don’t ski very aggressively. I’ve run these bindings mostly on tours but have also used them for lift service. I have total confidence in the tech boot/binding interface and the Onyx felt totally solid. The Onyx has a lot going on. In some ways, it seems like a little too much. There are many things to figure out before you can ski this binding with confidence. On my first run down, I hadn’t fully engaged the heel tour mode lever (the black looped item behind the heel piece), and I found myself doing inadvertent tele turns. This was partially pilot error and I learned my lesson fast. After that point, I made sure to bring the tour mode lever up all the way until I heard a click and knew it was engaged. Once you get accustomed to the “process” of these bindings, they work well and make a lot of sense. Sometimes it is the little things that can make for a happy tour. Case in point—the Onxy heel lifts. Some binding manufacturers claim that their heel lifts are easily engaged with a pole point or grip – not so in my experience until the advent of the Onyx. These heel lifts are super easy to elevate or drop (I use my pole grip). With other bindings, I literally bent my pole point. From what I have seen of next year’s Dynafits, this type of system is the way of the future. Thankfully. The toe mechanism on the Onyx warrants some discussion. There are some pros and cons, in my humble opinion. First of all, though the motion of applying pressure and opening the jaws (see above) may make for a very solid-feeling connection, it’s still a bit of a pain to lean on the toe piece to make it all happen. I don’t know what your experience is but on a hard tour, my hands and arms are tired and lack the precision required to always get my pole point into the little slot on the tour lever. It would be good if this could be done with one’s foot alone. This may be the case with all tech bindings and the toe pivot. There’s virtually nothing blocking the boots’ toe so switchbacks are a breeze (once you figure them out). 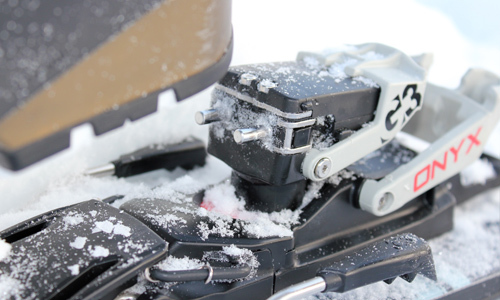 This simple, uninhibited pivot is what makes tech bindings so remarkable (and popular). This can be said of any tech binding though—nothing unique about the Onyx’s performance here. 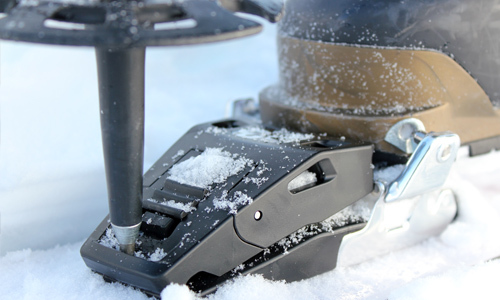 One of the benefits of the Onyx is the solid feel one enjoys when the bindings are engaged in ski mode. 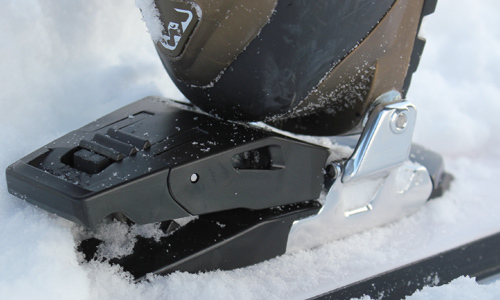 The DIN setting goes up to 12 so my guess is that these bindings are geared toward people who want to tour on a tech binding but want to feel the security and solidity of an alpine binding (or a Fritschi/Marker etc..) Perhaps it’s a slackcountry tech binding? One of the features that sets this binding apart is the ability to transition from ski to tour mode (and vice versa) without taking off your ski. This is particularly handy if you rip off your skins without taking off your skis or if you hit the bottom of a run and want to easily swap to tour mode from ski mode (but not put on your skins). At first, I thought this was a big benefit but then I realized how rarely I experienced a need for this. I’d like to figure out how to rip my skins, with skis on, so I’m hopeful that this feature will make for way easier transitions in the future. User-friendly heel lifts that actually are as easy to engage as claimed. Super beefy feel when in ski mode. All the benefits associated with the tech class of binding. A DIN of 12 for people wanting to go big. The plates these are mounted on means you could, if I understand it correctly, share one pair of bindings for two pairs of skis. Cool feature. The means of engaging the toe is not as simple as I’d like. 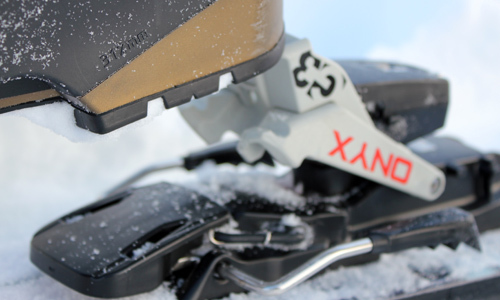 The Onyx is noticeably heavier than some of the other tech binding on offer. I found it difficult to adjust the tour mode lever (the round unit off the heel)with my pole. Actually, I found it impossible. I’ll bet I could figure it out with practice. This is only our opinion. Do you disagree? Did we miss something? Are we totally out to lunch? Join the discussion in the forums here, and let us know what you think. People like/dislike gear for different reasons so chime in and we'll get a well-rounded evaluation. Check back mid-season to see how our review stands up to our in-the-field testing - Andrew.